Democratic presidential candidate Hillary Clinton speaks to the U.S. Hispanic Chamber of Commerce in San Antonio, Texas, Oct. 15, 2015. The Sanders campaign raised nearly $2 million in the hours following the debate and Sanders was the main subject of attention in social media discussions both during and after the event. U.S. Senator Bernie Sanders debates former Secretary of State Hillary Clinton during the first official Democratic candidates debate of the 2016 presidential campaign in Las Vegas, Oct. 13, 2015. Clinton’s previous debate experience came to the fore Tuesday as she made a forceful presentation of her policy views, even as she mixed in a strong critique of Sanders on gun control and foreign policy issues. Clinton took part in 25 presidential debates during the 2008 primary battle with then-Senator Barack Obama and received generally strong reviews, even though Obama eventually emerged victorious. Former Michigan Governor Jennifer Granholm, a Clinton supporter, told MSNBC that the debate was “the best two hours of her campaign” so far. Clinton’s performance is likely to have a settling effect on Democrats who had grown nervous over poll numbers that showed Americans were increasingly distrustful of her. That concern helped to fan the possibility that Vice President Joe Biden would get into the race as an alternative for establishment Democrats. But a lot of commentators now question how Biden would gain traction in the current field. In the wake of the debate, many analysts now believe Biden would have an even more uphill struggle to win support should he decide to make a late entry into the race. Clinton’s next big challenge will come October 22 when she testifies before the special House committee investigating the 2012 terrorist attacks on U.S. facilities in Benghazi, Libya, that killed four Americans, including Ambassador Chris Stevens. Clinton was secretary of state at the time of the attacks and has been grilled by Congress before over her handling of the aftermath. Clinton’s upcoming appearance has taken on even more political overtones in recent days. Clinton has dismissed the probe as a “partisan political” investigation after recent comments by two Republican House members. Last week, McCarthy dropped out of the race for House speaker and acknowledged that his comments about Clinton had not helped his campaign. Clinton may have gotten a political gift from Sanders in the debate. 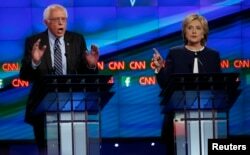 Prompted to chime in on the controversy over Clinton’s use of a private email account while secretary of state, Sanders agreed with Clinton that it was time to move on to other issues. That comment drew a huge roar of approval from the Democratic crowd inside the Wynn Las Vegas resort-casino, where the debate was held. But it won’t deter Republicans on the Benghazi committee from raising the issue when Clinton testifies, nor will it prevent the Republican presidential contenders from focusing on the issue as a way to attack Clinton’s tenure as secretary of state. Experts believe Clinton has righted her own campaign ship with her strong debate performance. But the former secretary of state still has work to do to improve her image with moderate swing voters who will play a huge role in next year’s general election, assuming that Clinton becomes the Democratic nominee.